He married Loretta Ratermann October 12, 1943 in St. Dominic Church Breese and she survives in Breese. 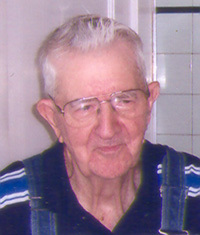 Bud was a Feed Grinder at Breese Grain Company and a member of St. Dominic Church Breese and the Breese Senior Citizens. He is also survived by a son Charles (Betty Jean) Eilers of Rockfield, Kentucky. 6 grandchildren: Scott Eilers, Melanie Reeder, Chad Eilers, Tasha Slabaugh, Cynthia Burton and David Phelps. 12 great-grandchildren and 1 great great grandchild. He was preceded in death by 2 brothers Joseph and Edward Eilers and 6 sisters Sophie Hilmes, Frances Ripperda, Ann Jansen, Marie Jansen, Katherine Kluemke and Eugenia Ratermann. Funeral services will be held Wednesday December 22 2004 at 11 AM at St. Dominic Church Breese with Father Patrick Peter officiating. Friends may call at the Moss Funeral Home in Breese Tuesday December 21 from 4 to 9 Pm and Wednesday December 22 from 8 to 10:45 Am. Memorial cans be made to donor’s choice and will be received at the funeral home.